Key Perspectives: the follies of religion; structure of a religion; great fall worm in the rose; inner remedy; psychology of religion rediscovering; inner core of religion; towards a spiritual religion of humanity; culture of oneness. When we look at contemporary religious scene we find two contradictory trends. On the one hand a strong and brutal resurgence of religious fundamentalism; on the other hand, in the more enlightened minds, a seeking for a more universal spirituality beyond the church, dogma and the priesthood of organised religion. We have to admit that religion in its outer form has been a factor of division and conflict, war and strife. But in its inner essence, religion is or can be a powerful and uniting force which can steer humanity towards a deeper and lasting unity and provide a firm spiritual foundation for a globalising world. But to transform religion into such a uniting force we need a new paradigm of religion based on its spiritual source. This paper is an attempt to arrive at such a uniting paradigm of religion based on an integral spiritual vision of life. The article examines the main causes behind the failure of organised religions and presents a spiritual paradigm based on a path of inner transformation of religion. What is the reason for this miserable failure of organised religion? To answer this question, we must have a clear understanding of the structure of a religion. Any religion can be viewed as a collective organism with a physical, vital, mental and spiritual body. The inner most core of every religion is a spiritual intuition or revelation or experience revealed to a prophet or a sage or many such religious leaders. The other important part of this inner core is the spiritual discipline and practice for inner realization of the spiritual ideal. This is the spiritual core of a religious organism. Then comes the mental body of religion made of its philosophy or theology; the next outer layer is the vital body of religion made of its mythology, ceremony and rituals and the social customs; and finally the outer most shell or the physical body made of the church, mosque and the temple and the priest. The organised religion belongs to the most physical and vital body of a religion. What we mean by organized religion is some concept of God revealed in a scripture and institutionalised in the Church, plus some mythology, ceremony, rituals and priesthood which claims to mediate between God and Man, asserting that its path or prophet as the only way to God, and without any vivifying spiritual experience, knowledge, practice or presence which is the real soul of a religion. All these four dimensions of religions are needed for an integral spiritual life. But the soul and life of a religion is its inner spiritual core. All the other three outer layers of religion derive their life from this inner dimension. A religion can live and do its spiritual work only when this spiritual core is kept living, active and progressive with a constant stream of spiritual aspiration, practice, experiences and realisation. When this inner core of religion becomes stagnant than the religion begins to die. The main problem with most of the organized religions is that they have strayed away from their life-giving spiritual source and what remains is a skeleton of dogma and rituals. The major mistake of organized religions is that they ignored in practice, while professing in words, the warning of Christ “The Spirit saveth, letter killeth”. These religions instead of relying on the “Spirit that Saveth” have clung to the “Letter that Killeth”. And when the Spirit withdraws, the Ego, cult-ego, takes over¾the mental ego with its rigid and inflexible dogmas and the vital ego with its urge to dominate, possess and rule. So the history of organized religions has become mostly a part of the political history of humanity, rather than its spiritual history, with the mental and vital ego trying to conquer the world in the name of God! Only they leave behind a splendid Name. So the canker, the worm in the rose, is the cult-ego. And the most pernicious form of this Ego in religion is the dogmatic assertion that my path or prophet is the only way to God or heaven and all others who follow other paths belong to the Devil and are condemned to eternal hell. It is this ignorant assertion which is the source of all fanaticism and fundamentalism in religion and has made religion into an instrument of division and hatred among people. All other aspects of religion like scriptures, mythology, ceremony, rituals, symbols can remain in the future, because they are necessary aids in the progressive spiritual evolution of the soul. But this dogmatic and exclusive assertion is a phantom of the past and has no place in the future. Some orthodox sections of the society may cling to these phantoms and they may raise aggressively to the surface as it is happening at present, in the form of fundamentalist terrorism. But they are allowed to rise in order to be eliminated. This is one of the methods of Nature for getting rid of things of the past which are harmful or no longer helpful to the future evolution of humanity. So we need not be too disturbed by the growing menace of fundamentalism and religious terrorism. They are allowed to rise in order to be thrown out. If the warrior-energies of nations, instead of fighting amongst themselves, join together to fight the menace, then it can be defeated. But inflicting a military defeat on the forces of fundamentalism is only a temporary solution to the problem. The permanent solution to the problem lies in an inner moral, psychological and spiritual regeneration of religion. The outer reformation through reason or social renovation is helpful but not enough. There has to be an inner regeneration of the mind and soul of religion. There are three possible approaches: first is the psychological approach or in other words, application of psychology to the religious and spiritual development of the individual; second is to revive the spiritual core of each religion and reinvent or reshape the other outer dimensions in the light of this recovered spiritual intuition and experience; third is a spiritual religion of humanity. Let us briefly examine these possibilities. i) Self-knowledge and self-mastery are the basis of spiritual development. ii) There is perfect equality only at the spiritual level but not at the psychological level. In the psychological level, human beings differ widely in their nature, temperament, capacities and development. Every seeker should be given some understanding of the highest spiritual ideal. But for practical discipline, each seeker has to be taken as he is in his present condition of development, provided with an ideal and discipline which are in harmony with his present nature, capacities, temperament and in this way slowly and gradually, step by step, raised to the highest ideal. iii) An ideal religious system must be able to engage the whole being of human and all the parts of their inner and outer being – physical, emotional, intellectual, dynamic, ethical, aesthetic and spiritual. There must be a symbolic physical activity for expressing the inner adoration in an aesthetic gesture and a physical discipline for maintaining sound health; a beautiful symbol or interesting stories for the emotional being; an idea for the mind to hold on; an ethical discipline for moral development of the individual; a psychological and spiritual discipline for the spiritual development of the inner being, and for the realisation or manifestation of the inner divinity in man. iv) Similarly, an ideal religion should have a path or a discipline for the spiritual development of every type of seeker–the physical person who lives predominantly in his bodily consciousness, the emotional person who lives in his heart and feelings, vital person who lives in his dynamic life-force and will, the intellectual who lives in his thinking mind and the more inwardly advanced yogi or the mystic type who is capable of going within in deep meditation. These are universal psychological principles which are valid for all times, not only for religion but for human development as a whole. They are also some of the principles of Indian Yoga. We believe that the religious and spiritual discipline of the future has to be based on the principles of Yoga. But in religion, psychology is only a means towards spirituality or spiritual experience. This brings us to the second approach which is to revive the original experience which gave birth to the religion and rediscovering the inner discipline for arriving at these experiences. So no scripture of the past, present or future however luminous and profound it may be, can contain the entire truth of the Spirit. No revelation or written word can entirely express the Infinite. In fact each scripture or spiritual teaching or revelation expresses only that much of the truth of the spirit which the humanity of the age, epoch or the civilization can understand and assimilate. As the human consciousness progresses in its course of evolution, new vistas of the Spirit are revealed to the illumined vision of yogis, seers and sages giving birth to new religions, scriptures, philosophies and teachings. This process will go on until a day may come in the future when outer intermediaries like scriptures and prophets will be no longer needed because humanity as a whole will be ready to receive the direct guidance of the Spirit from within. And until then, religions, to remain alive and relevant for the future, have to break away from the prison of their conservative attitudes and keep their mind, heart and soul open to new revelations of the Spirit. The third approach which can perhaps lead to a lasting spiritual transformation of religion is a path of universal spiritual humanism. There are two things which are needed for the spirit of religion to recover its highest truth and prevent it from falling again into division and darkness. First is an Idea or Ideal sufficiently universal and non-dogmatic to prevent the formation of cult-ego and its assertion “my path, my prophet, my God is the only way to heaven”. Second is an inner and outer discipline for making the idea concrete and real for the consciousness and life of the whole mankind. We may include in this spiritual unity, the ideal of modern ecology, unity of man with Nature. But here also, like the humanistic ideal, the ecological ideal has to be spiritualized. In the spiritual vision, Nature is not only physical but also psychological and spiritual. Nature is the creative force of the Divine Unity and the source of all physical, psychological and spiritual energies in our own being and the universe. Our human nature is part of universal Nature. Not only our physical being is part of the physical energies of Nature but our psychological and spiritual energies are part of the corresponding energies in universal Nature. So in this spiritual vision, ecology means unity and harmony with Nature in all levels of our being¾physical, psychological and spiritual. When we integrate the spiritual vision of human unity with the spiritual vision of the unity of Man and Nature, we have the Religion of Oneness, Oneness of all existence in the divine unity of the Spirit. So the essence of the experience is the complete disappearance of the ego or the separate ‘I’ and the sense otherness, leading to the consciousness of an all-inclusive Oneness in which all creation is felt as a part of our own self. To generalize and establish this experience, and not just the idea, in the consciousness of humanity will be the aim and mission of a spiritual religion. But the most important part of the work of a spiritual religion of the future is to discover the path which will lead the individual and collective consciousness of humanity to the Oneness-experience. We will discuss briefly here the basic principles of the path. The first step is to unify our own individual being. Only like can perceive the like. To feel and perceive the unity and harmony that governs life and world we have to unify and harmonize the various parts of our own being our body, life, mind and soul and feel harmonious and whole within us. So integration of our body, life and mind around the spiritual centre of our being is the first step in the path towards unity. The second principle of the path is that unity is not something to be created. It exists as an eternal fact in the spiritual dimension of our own being. We have to become conscious of this eternal fact of life which is within us. So the second step is to create a system of education and culture by which each individual can become conscious of the truth of unity either by entering into the spiritual depth of his being through a discipline of active introversion or allow the unity-consciousness in the depth to invade and possess his external being through a discipline of passive, silent and receptive openness or a dynamic surrender. The educational challenge here is to make the ideal of oneness compelling and attractive to all the parts and faculties of our being, thought, feeling, will, emotions, sensations and the dynamic vital force so that it leads to a concentration of the whole being on the idea. The ideal of education is to help each individual to find his own path towards oneness. Here, we have to apply all the psychological principles of Yoga, which we have discussed earlier. We must remember here that there is not a single experience of oneness or a single path to it. There are many paths each leading to a unique experience. It can be experienced as the unity of our own impersonal and universal Self through a path of knowledge. Or else it can be experienced as the unity and universality of an impersonal divine Love or that of an all-beautiful and all-loving divine Person through a path of love, devotion or surrender. It can also be experienced as the unity and universality of an impersonal or personal divine creative Force and Wisdom through a path of works and action. By a synthesis of all these path we can experience the integral fullness of the Divine Unity and Oneness in all its aspects. The third principle of a oneness-culture will be renunciation of ego. For ego is the source of division and conflict in human consciousness and the main obstacle to the perception of unity. So a clear experiential understanding of the structure of human ego and a progressive dismantling of the ego from the inner being and the outer life of man will be an important and integral part of the education and discipline of a oneness-culture. This inner discipline and education of the individual has to be supported by a collective environment which actively promotes, encourages and rewards every activity which leads to or helps in the understanding and expression of oneness and the values of oneness like unity, mutually, harmony, sharing, and self-giving. In other words, the present competitive culture has to be replaced by a partnering culture in which every individual and the collectivity makes a sincere and creative effort to link himself or itself with other individuals and collectivities in a mutually complementing harmony. Rishabehand, Sri Aurobindo, Life Unique, Sri Aurobindo Ashram, p. 219fn. 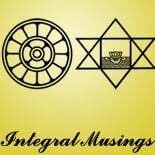 This entry was posted on May 30, 2012 by integralmusings in Religion, Spirituality & Philosophy.